Late Friday afternoon, my husband, our three daughters and I all flopped on the couch exhausted and hoarse after what should have been a fairly routine cattle drive went all wrong! A drive that usually takes 2 hours, took 5 and 1/2! The cows took every opportunity to make the drive a real challenge! This time of year all the mother cows are now without calves at foot, grazing happily on their own. They are bred, and housing a growing baby calf which will be born in February. They have this time to ‘dry up’, meaning they do not have to supply milk. This is healthy for a mother cow to have this time to herself. Friday morning it was time to move the herd to another part of our ranch for their final bout of grazing before we start feeding them around Christmas or the end of the year. 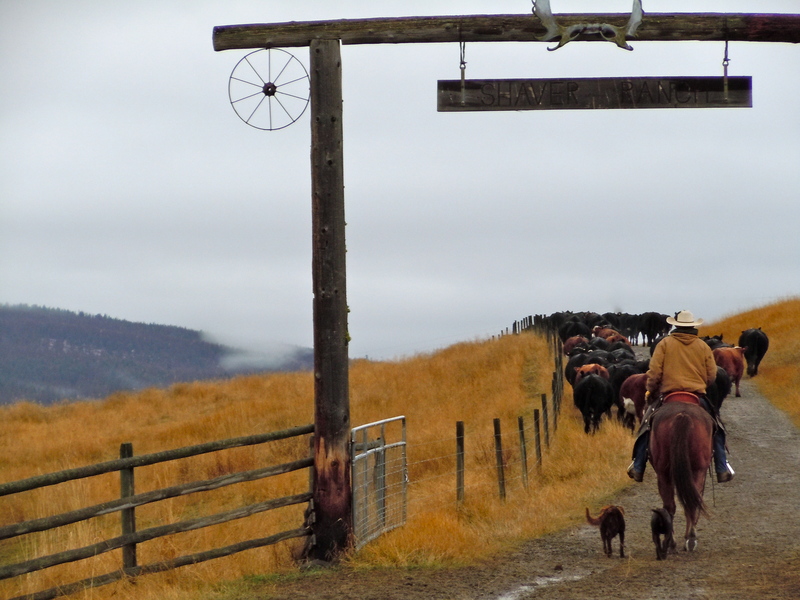 This cattle drive is about 5 kilometers down an old highway, past a forestry campsite, over a little bridge, along a busier road, under the highway and lastly through some acreages and then into our ranch, which is called the ‘Bateman’ place. It is tricky to chase a large group because there ends up being a long distance between the first cow and the last cow. The roundup, where the drive started went without a hitch and we were off down the road with Doug riding Count, our daughter on Sully, myself on King and our Ranch-hand and two other daughters on the Gator. We were moving along as planned until we got to the little bridge that crosses a smaller, but deep, iced-up creek. The little bit of hay was not enticing enough to lead the first cow across and instead they stepped down off the road and into the thick willow. Our hope then was that they would cross the creek, but with it being steep and frozen, they didn’t want to do that either. Finally after going back and forth, for what seemed to be forever, our youngest daughter was able to run a armful of hay up and get the first cow to walk across the bridge! They then proceeded one by one, single file, to tiptoe across. Cattle and horses are usually leery of crossing bridges because of the hollow sound it makes beneath them. Although most accept it once they’ve done it, that wasn’t the case on Friday. After nudging 250 over, 30 decided it wasn’t for them and they were not going. Our ranch hand and our youngest daughter had gone on keeping ahead of the lead, so the four of us were left to try and get these last 30 across. After 45 minutes of: up the bank, down the bank, yelling and flapping our arms we realized ‘they had won’ and they were NOT going to go. Fearing the rest of the herd was nearing the highway, Doug on Count ran to catch up. My daughter climbed on my horse behind me and we drove the ‘stubborn’ ones back to where they came from. Thankfully the three of us were able to get them into the corral, so we didn’t have to round them up again! We left them there to ‘think about what they had done’ (ha ha), and quickly loaded up the horses in the trailer and raced over to find the cattle drive. It is amazing how mad you can be at cows, with them being completely oblivious to it! 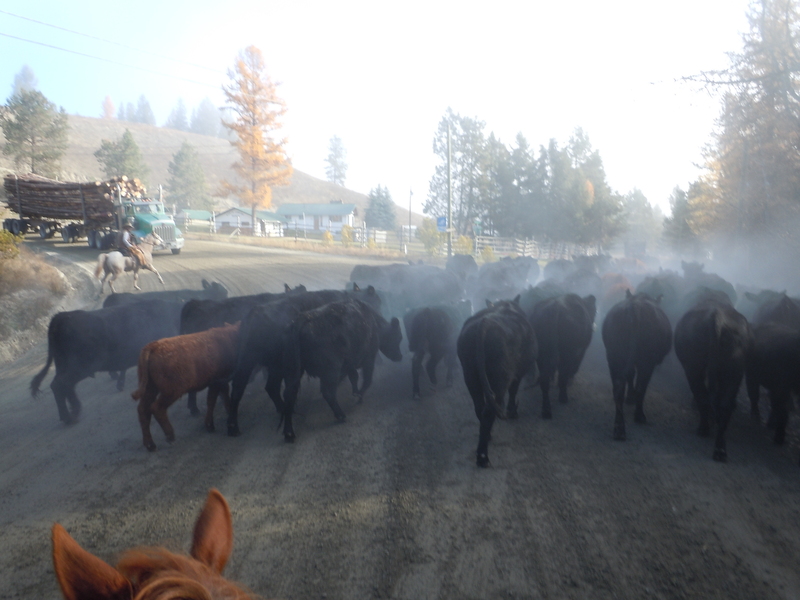 We seemed to spend a lot of our ranching life ‘fighting’ to get cows to go where they actually really want to be. Figure that one out! Here is a video of ‘Blue’ and his 3rd session of training. As this is a series, watch the 1st & 2nd blog on ‘Frontier Blue’ if you haven’t already. This is the 2nd time ‘Blue’ has had a saddle on and the 3rd time being worked with. The object of this session was to continue to have Blue get a feel for the saddle. We were very happy that he was able to pick up right where we left off, assuring him the saddle and rider were nothing to fear. Horses are very smart and remember what they learnt last time. The trainer is not concerned of the speed Blue is going, wether he is at a walk or trot. The important thing is, he moves out when asked. Blue is quite laid-back, so only moved out at a walk. Although our other horse Count, took off at a lope the 1st time Doug got on his back. He wasn’t bucking, he just was a lot quicker in his nervous state. As you can see, we use a halter for the first couple rides. The horse has enough tack to learn to get used to, so we do not add a bridle and bit into the mix. It is good for a horse to learn pressure points on his nose and the halter is teaching him these at this point. If you notice the trainer is already teaching Blue to recognize leg pressure, and to move away from it. He will use his outside leg to steer the horse, as well as guiding his face with the lead line. It is very important to continue to teach the ‘whoa’, as you can see at the end here where the trainer asks him while he applies pressure to the nose. Yesterday we were suppose to be weaning our calves and sending them on a truck to Lethbridge Alberta. We decided seven years ago to start hauling our calves to Balog Auction in Lethbridge because even with the cost of trucking we would make more money than selling them in our area of BC simply because most of the feed yards are located in Southern Alberta. On Saturday we woke up ready to spend the day gathering all the cows that we had brought home from the mountains that were currently at a nearby neighbours field that we rent. Well boy were we in for a surprise, we woke up to a blizzard, but there was still a job to get done because trucks were coming the next day to load up our calves, so we had no choice, but to bring all those cows and their calves home. We got dressed up really warmly and headed out on our horses. By the time we got the cows home we were cold to say the least, but we also started having second thought about sending our calves on a liner the next day when they were wet and cold. 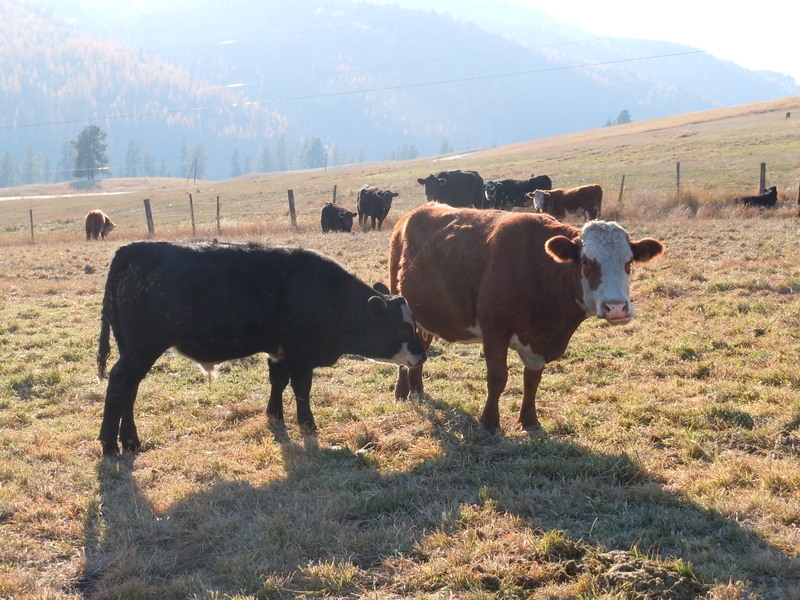 This is important because weaning is a stressful time of year for the animals (the calves are taken away from their mom’s), so we try and make it as stress free as possible. We decided adding the weather variable to the calves at this pivotal time wasn’t a good idea. We want our calves to look their best and be as healthy as possible when they go through the auction ring. 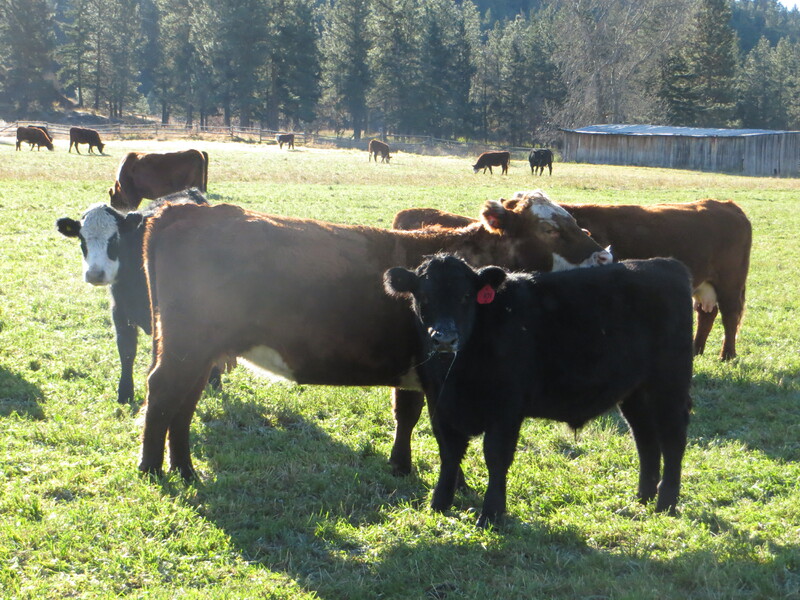 If a feedlot buys our calves and they are healthy and do not get sick they will perform better and that same buyer would be more likely to buy our product again in the future. In addition, we want to make that transition for the calf as stress free as possible, so that means sending them away in the best possible health condition. We were humming and hawing about if we should cancel flights and cancel the truck that was coming, so we decided to phone Balog’s and see what the weather was doing over there when we found out some more bad news. The market on calves dropped 30 cents since last week. Prices had been strong all fall and we were really excited that we might actually make some money in this crazy business, but we were a week late! We made the decision to hold our calves and keep our fingers crossed that the market picks back up. This year we were lucky enough to have an extra 250 round bales (we had a great season for growing hay), so that helped our decision. Last year for example this would have been a tougher decision to make because we didn’t have enough feed and had to buy some, so if we held our calves over for longer that means more pasture is being used and then more hay would have to be bought, which only increases our input costs. 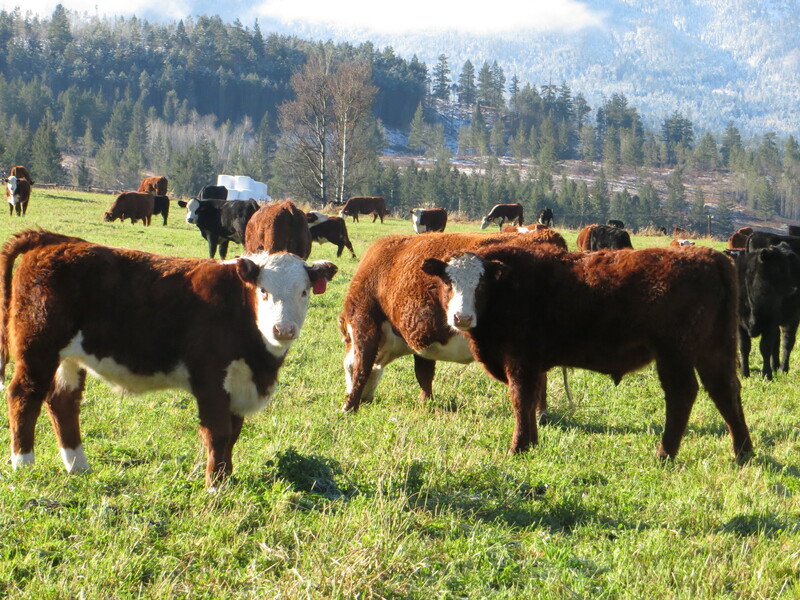 The cattle business is tricky because markets are volatile and it is a business and you have to make business decision and follow the markets. It is a lot more complicated than people think we can no longer survive just being good producer or knowing our cattle we have to know and understand markets as well. We are hoping our decision of keeping our calves pays off and the markets will increase again soon! Unfortunately, I didn’t get a picture when it was snowing on Saturday, I think my fingers would have been too cold to operate my camera anyways. 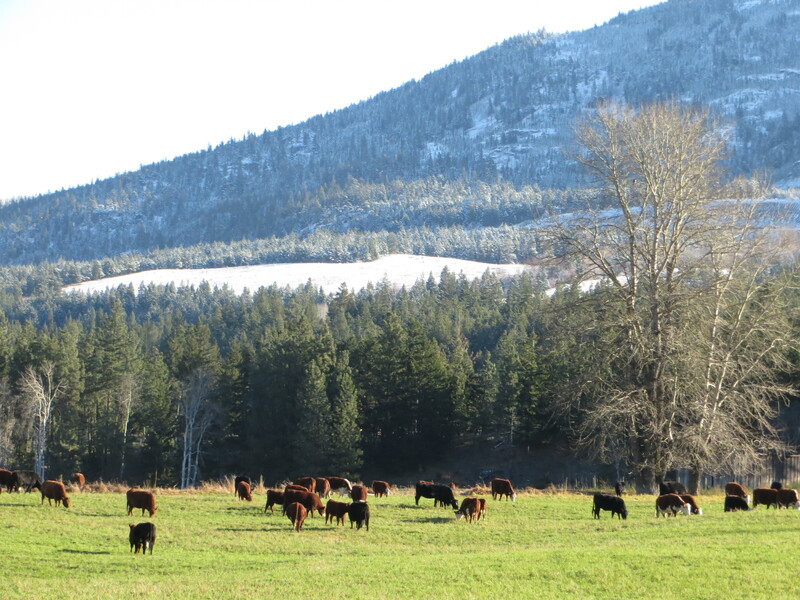 Here is a picture from today of all the calves and cows still in the field and snow in the mountains above. It still feels strange the calves are suppose to be gone right now and I should be in Lethbridge…. 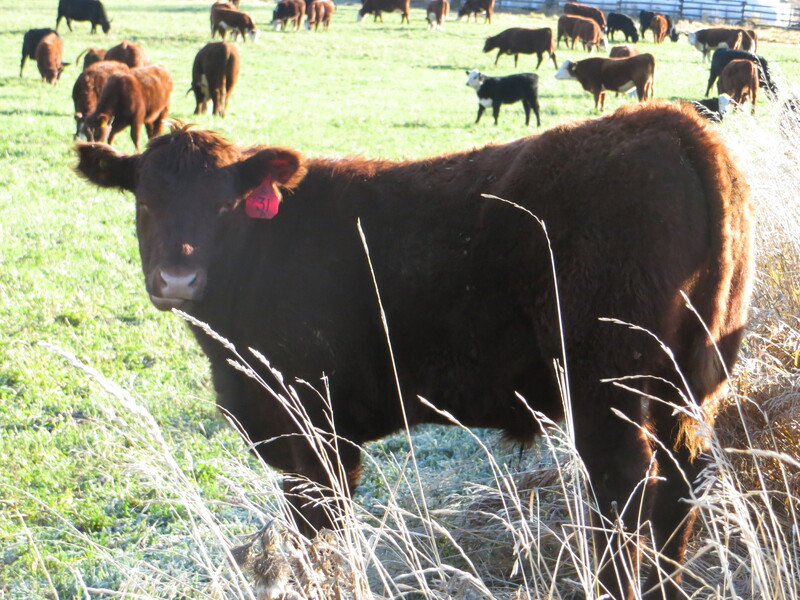 Here are some pictures of our 2013 calf crop. These guys are only 8 months old. The mamas did a great job this summer and we have some beautiful calves! The big animals in the pictures are the mama cows. The slightly smaller animals are the babies they had in February. These babies have been nursing off their moms for the past 8 months, and as they get older eating more and more grass on their own. 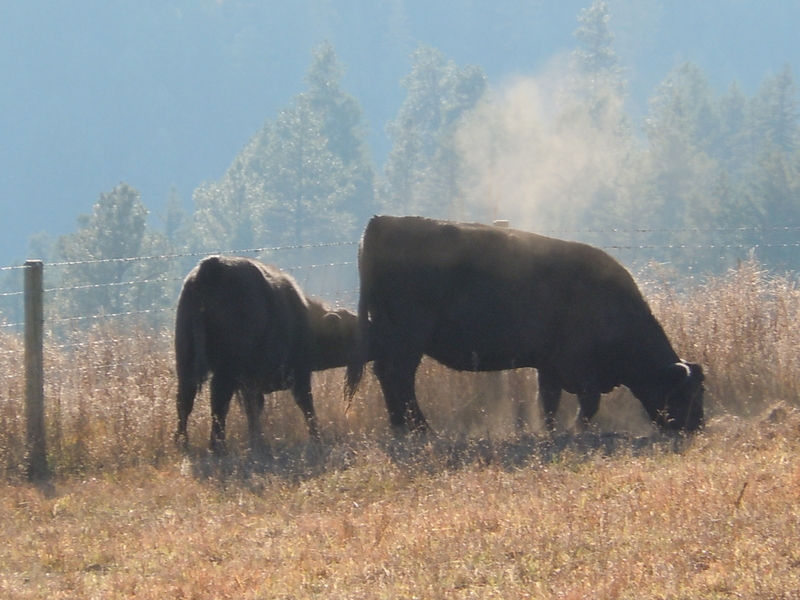 This is the time of year on BC ranches where these babies will be gathered up and weaned off of their mom. The mother cow needs time to rest and dry up her milk to get ready to have her next baby the following year. This is 570+ animals running after the tractor and hay bale. This is a treat for the cows to get fed, as they will be back out on grazing until Christmas time or the snow pushes them out. They got this feed because we needed to gather them again easily the next day and there was not enough grass feed in the field they were in. So as you can see they thought this ‘feeding in October’ was fantastic! !